Despite the country wide late winter and pockets of snow that had outworn their welcome, the end of April 2018 finally saw spring arrive, and more importantly Manitoba’s spring black bear hunt. 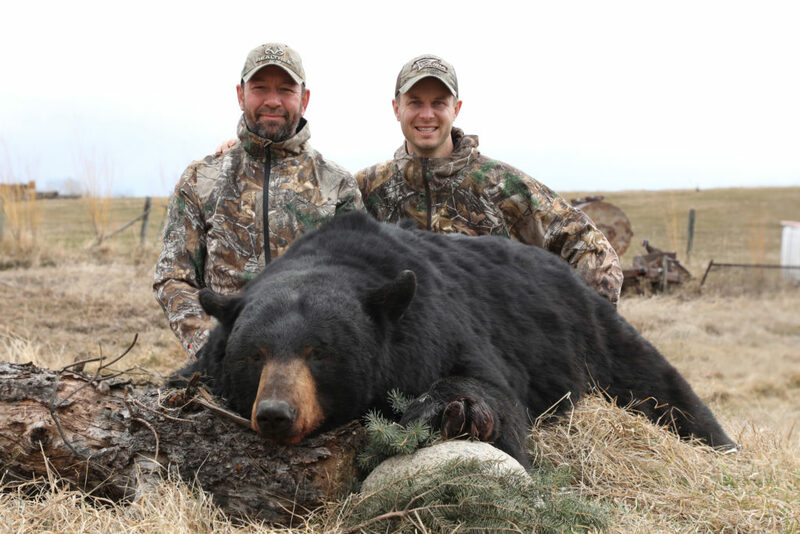 With nervous excitement and the itch to get back out in the woods we packed our bags and headed to the beautiful province of Manitoba, where Kevin Beasley and guest Dennis Laporte would spend the week black bear hunting. After landing in Winnipeg it was just a quick two and a half hour drive west through prairie country to Muskeg Country Outfitters, run by Dean McCulloch. While we’ve got no problem roughing it in the name of great hunting, there was certainly no sacrifice to our comfort on this trip. With a friendly and hospitable staff we were well taken care of – not to mention provided satellite television, full power, Wi-Fi, hot water and all the amenities of home. On the morning of our first day hunting we put back an awesome breakfast of pancakes, sausage, bacon and eggs, then sighted in our crossbows and readied our gear for the evening hunt. Just a week before our arrival there was eighteen inches of snow on the ground, so we had to come prepared for whatever weather was thrown at us. This first evening was calling for a drop in temperatures so we bundled up with the warmest gear we could and headed out. Muskeg Country Outfitters hunts thick woodlands and swamps on the edge of farm country, and with the combination of untouched wilderness bordered by rich farmland, we would be set up in high volume, high traffic areas. Several miles apart Kevin and Dennis settled into their tree stands and took deep breaths – finally the hunt was on. No more travelling, no more prep work, just keeping quiet and staying vigilant for any flash of fur or rustle of leaves. While the cold first night didn’t result in any bears down, Kevin did have the rare pleasure of watching a fisher exploring the woods below him, and Dennis spent a large part of his night watching a young black bear eating at his bait. With the temperature dropping from 25 Celsius the day we arrived to 1 Celsius our first day hunting we had no complaints about our first night and were excited to get back out for the second evening in some warmer weather. Due to the wind Dennis moved to another stand by a large swamp. With all the negatives a long winter may have, the noticeable lack of mosquitos, black flies and wood ticks was not one of them! So with the rare opportunity to hunt bug-free in warm spring weather, as well as a light wind blowing at our faces, the night felt promising. With an hour left of daylight Dennis noticed a block of black moving through the trees. It stopped in a small opening and looked our way, and seventy-five yards into the timber we were staring head on at what had all the signs of a giant Manitoba black bear! 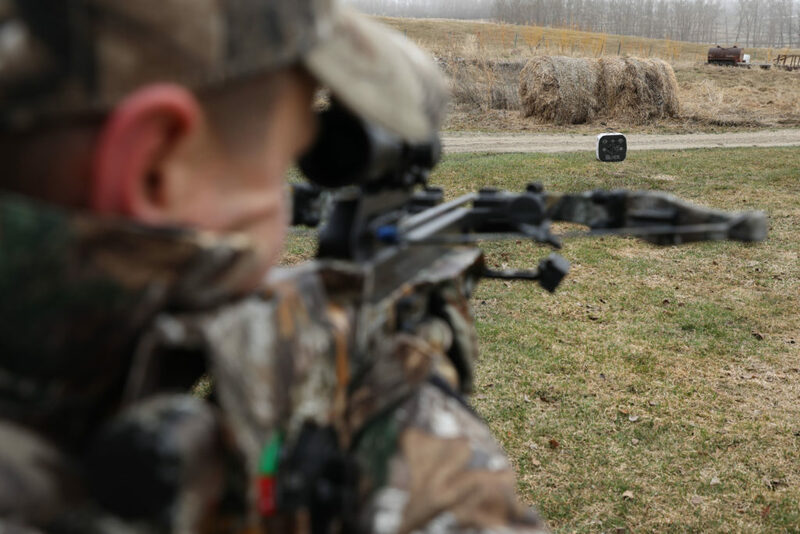 As it moved through the trees at a snail’s pace, Dennis shouldered his crossbow to both get a better look at this bear and be ready for his shot should he get the chance. Working across the woods behind the bait it eventually did start coming in, and gave Dennis a good opportunity to judge it. There was no mistaking; this was a BIG mature boar. With that maturity came the extreme cautiousness that can make these bears so elusive. As he stepped towards the bait area something froze him in his tracks, and as slowly as he had worked in he backed out through the trees, leaving Dennis wondering if he had missed his shot at this tank. Twenty minutes later, an on-edge Dennis scanned the trees, and to his disbelief he spotted the same bear working into the bait from a game trail on the left side! Again taking his time, he slowly worked towards the bait area, step by step. With not only legal shooting light but camera light becoming a concern as well, it was becoming a race against the sun to try and get a clean shot on this boar. A few steps from a perfect shooting lane, the bear froze in his tracks again, and started backing up. Dennis was having the worst kind of déjà vu. Two steps back, and it froze again – and carried on forward. From then on Dennis made no mistake, and once the broadside shot presented itself he sent the arrow twenty yards right on target. It’s moments like this that we are glad to have cameras to document not only these incredible encounters, but to capture the raw emotions of passionate hunters after such a nerve-racking and well earned moment. Once the wave of adrenaline passed, Dennis called Dean and they pulled the boar out with an ATV, confirming just how large this great creature was. When they got back to camp Kevin was waiting to congratulate Dennis and get eyes on this brute that hit the scales at 430lbs! The next day we took some pictures, and then got to processing Dennis’ bear. 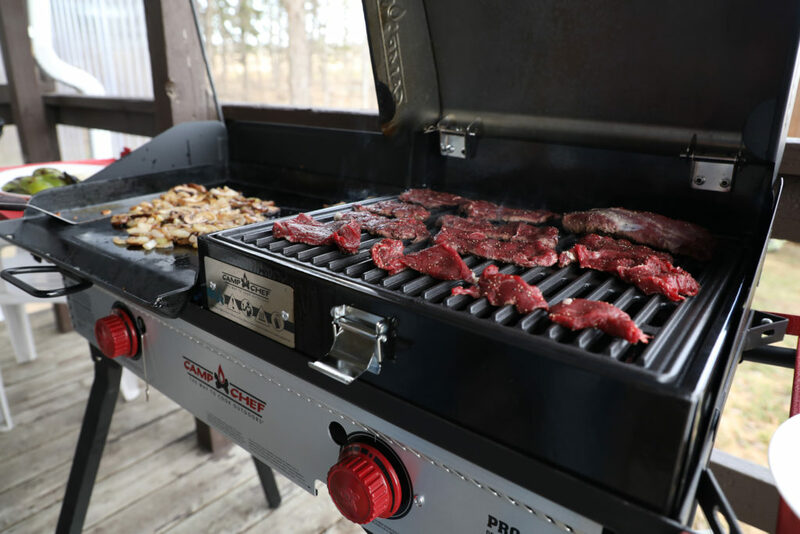 Of all the wild game we’ve eaten, we have to say that black bear is one of our favorites. 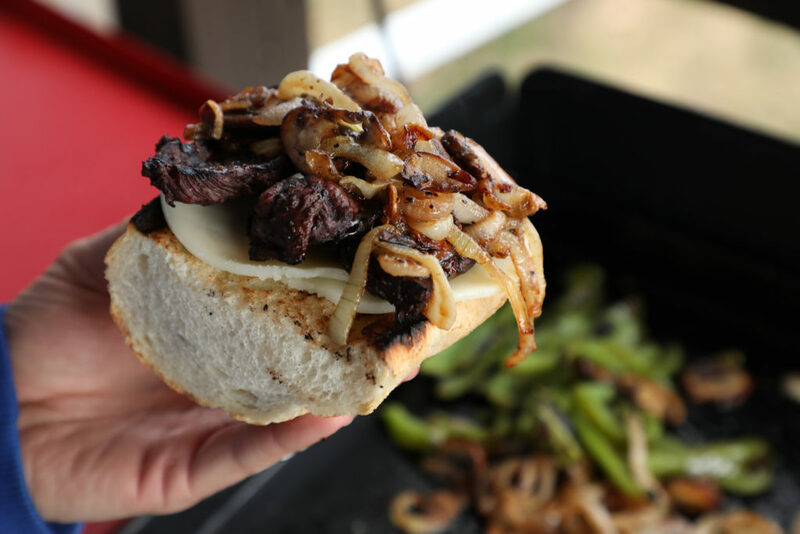 That feeling was reinforced on this trip when we cooked up the back straps for lunch into some tasty Philly cheese steaks. Stomach full, Kevin headed out for another evening sit in hopes of harvesting a bear himself. The stand he was sitting in had plenty of pictures of multiple bears on the bait, particularly a mature chocolate color-phase black bear. Manitoba is known for not only great bear size and numbers, but for being home to a wide array of color-phase black bears as well. On Dean’s game camera’s he had been seeing chocolate, cinnamon and blonde color-phases in his area, a claim not many other parts of the world can make. Kevin saw plenty of action early on. A nice younger black bear with a white mark on its chest came into the bait, and while it was eating, Kevin looked behind it into the woods and spotted what looked like the chocolate colored bear he was after. But before we could get a good look at it, the chocolate bear charged the smaller one and ran off after it into the woods! While it was disappointing that he left it was nice to see him showing dominance as it let us feel confident that this was the mature bear we were hoping for. Half an hour later Kevin spotted the smaller black bear working back towards the bait, and sure enough the chocolate was not far behind. The chocolate once again chased off the younger bear, but this time it looked like Kevin was going to get his shot as he worked his way into the bait. Unfortunately, as the bear came into the bait he was too quartered towards for Kevin to make an ethical shot, and we once again watched this gorgeous color-phase bear leave without presenting an opportunity. With all this action and no chances at a shot, Kevin did all he could do- sit and wait and hope for another opportunity. As luck would have it, with light just starting to fade Kevin spotted the chocolate through the trees coming back towards the bait a third time. With Kevin’s crossbow shouldered he waited and waited as the bear came back in, quartering towards again just enough to not give a shot. Finally he did open up broadside and took a step, presenting a shot just for a second. 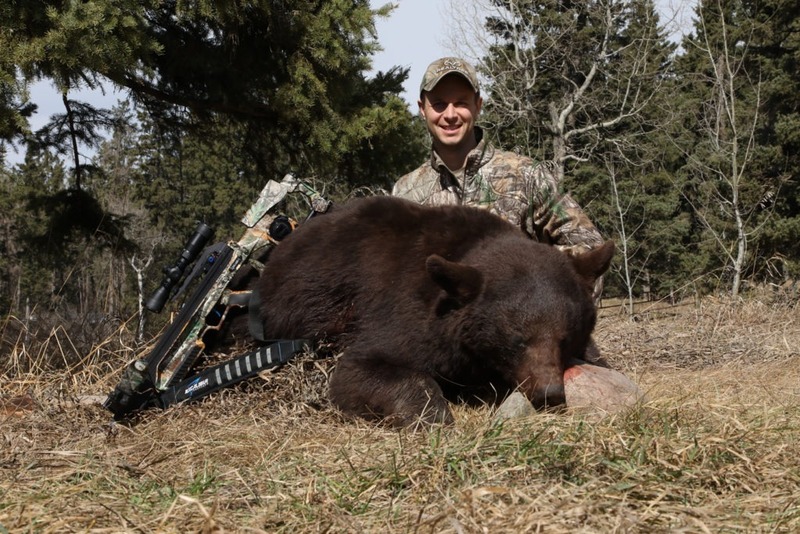 That was all it took as Kevin took advantage, making a great shot at twenty-five yards and he soon had his first ever color phased bear down! Our week in Manitoba was everything we had hoped it would be and more. Harvesting two mature giants of the forest and in such exciting fashion made for thrilling hunts. To see so much action that early in the season, with snow on the ground just a week before really was incredible. What we cherish as much as the harvested animals are the memories made out in nature and with our friends back at camp. Altogether that makes for an adventure we will never forget! 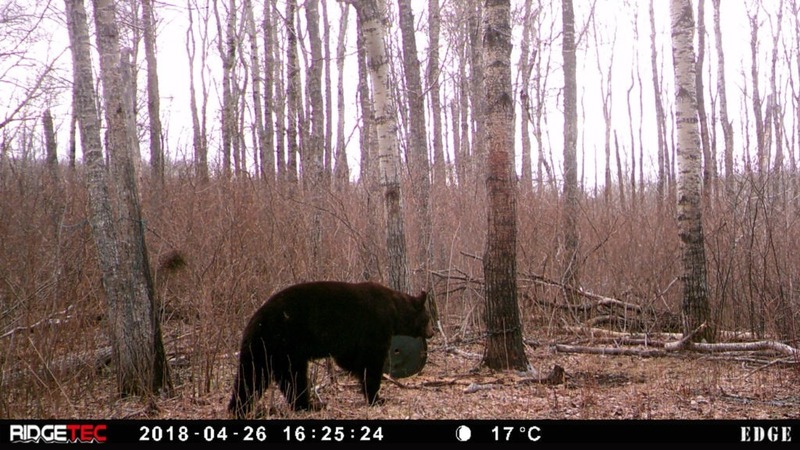 For information on spring black bear hunting at Muskeg Country Outfitters, visit the Muskeg Country Outfitters website. Check out our Big Game Hunting page for more information on spring black bear hunting in Manitoba.